Superb international networking Over 70% of delegates at this event are CEOs or equivalent and over 40 investors from private equity and REITs attended in 2014. This is a unique opportunity to meet the European industry. Ideas that will change your business Our CEO speakers explore new ideas, business models and markets, followed by detailed and impassioned debate. This year's workshops explore burning topics. The broader perspective This event is built for companies who want to look and learn externally. It is for those who accept that within a decade, every sector in this industry will be dominated by international players. It is for open-minded innovators. The private hospital landscape in Europe is set to transform with massive consolidation and the emergence of international players. 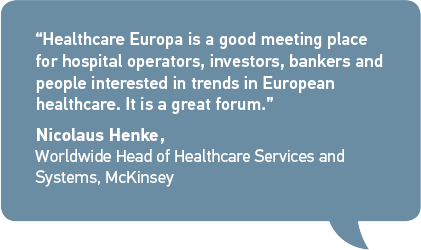 Healthcare Europa, the only Pan-European event on the private healthcare sector, is a unique opportunity to meet your European peers and potential investors and to understand how the sector is changing. The day will inform your business strategy and enable you to build valuable new partnerships. In 2015 we expect over 350 delegates at the event, which attracts an audience which is 70%+ CEO or equivalent. Hirslanden, the largest private hospital group in Switzerland with sales of 1.4bnSF, has changed dramatically as the statutory insured market has opened to the private sector. Such patients now account for over 40% of Hirslanden’s mix. Ole looks at the cost, differentiation and payor issues this threw up. As well as Switzerland, Mediclinic has a strong presence in the Middle East and is the largest of the Big Three groups in South Africa. Ole looks at where, and when, lessons learnt in one country can be re-applied elsewhere. In 2012 San Donato, the largest Italian private hospital chain, with 2013 sales of €1.4bn, rescued Italy's largest university hospital, San Raffaele. Dr Paolo Rotelli looks at the management challenges involved in turning round San Raffaele and incorporating it into a for-profit hospital group. He will also give an overview of the Italian hospital market. Is it ripe for consolidation? What are the prospects for private sector involvement? Jonathan has spent the last three years trawling the world for opportunities for Life Healthcare, the big South African hospital group, which has now invested in India and Poland. He provides an overview of what assets look like in different geographies. What are the pitfalls and what are the opportunities? Optegra is the largest player in ophthalmology in Europe with 22 specialist hospitals in the UK, Germany, the Czech Rep and Poland. It has also recently opened a hospital in China. Roberto looks at the potential from new treatments, gives an overview of the European sector and looks at opportunities in the developing world. Internationalisation, consolidation, rationalisation - dentistry and areas such as ophthalmology and cosmetic surgery are changing fast in Europe. Healthcare Europa, the only Pan-European event on the private healthcare sector, is a unique opportunity to meet your European peers and potential investors and to understand how the sector is changing. It will inform your business strategy and enable you to build valuable new partnerships. 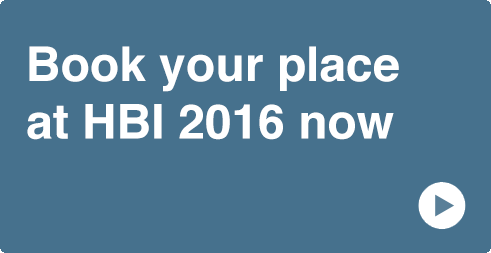 In 2015 we expect over 350 delegates at the event, which attracts an audience which is 70%+ CEO or equivalent. In just five years Dr Malo has built his Portuguese group into a global empire offering dentistry, cosmetic surgery, even spas and wellness from China to Colombia and from the USA to Europe. How? And what are the challenges he has faced? How do you build a brand based on quality across over 300 outlets? Justin is CEO of the largest private dentistry chain in the UK and Ireland. He looks at how Oasis acquires, recruits and trains to build a quality brand based on culture. Per looks at how Colosseum, by far the largest Scandinavian dentist chain, is building its brand in terms of service quality, internal culture and marketing. Consolidation is set to transform the diagnostics landscape. Healthcare Europa, the only Pan-European event on the private healthcare sector, is a unique opportunity to meet your European peers and potential investors and to understand how the sector is changing. The day will inform your business strategy and enable you to build valuable new partnerships. In 2015 we expect over 350 delegates at the event, which attracts an audience which is 70%+ CEO or equivalent. With operations in the UK, Germany, Ireland, Italy, The Netherlands and Spain, Alliance is one of Europe’s two largest imaging service providers. Guy looks at how national markets in Europe differ and at how and where the outsourcing market is growing. Imaging services represents 5-7% of expenditure on healthcare in most European countries. But many such as France and Germany have so far seen almost no consolidation. Curagita is consolidating the German market, Europe's largest. Martin looks at the barriers to consolidation and at the new business model which is emerging. This wide-ranging panel discussion will examine the opportunities and threats the lab sector faces in Europe. It is easy to view the lab sector in Europe as imprisoned by ever lower tariffs. As a newcomer to the sector, with a background in medtech and pharma, Jos Lamers looks at what steps labs can take to grow sales and boost profits and at opportunities in the industry over the next few years. Building an international lab business Ameera Shah, CEO and Founder, Metropolis Health In 12 years Ameera Shah has built Metropolis into one of the top three lab chains in India. She has also expanded into nearly a dozen countries, including the UAE, South Africa, Nigeria, Ghana and Kenya. What lessons has she learnt along the way? The elderly care landscape in Europe is transforming with the emergence of international players in homecare and nursing homes. Healthcare Europa, the only Pan-European event on the private healthcare sector is a unique opportunity to meet your European peers and potential investors and to understand how the sector is changing. The day will inform your business strategy and enable you to build valuable new partnerships. 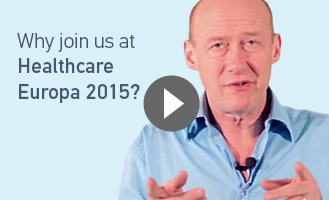 In 2015 we expect over 350 delegates at the event, which attracts an audience which is 70%+ CEO or equivalent. Dr Marian looks at how Orpea has expanded nursing homes and psychiatric care across Europe and at its plans for China and elsewhere. What are the main challenges? How strong are the synergies? Annette has built, and runs, one of the most international healthcare service companies with dialysis clinics in 18 countries and four continents. How difficult has this expansion been? How far does she have to adapt Diaverum’s business model to local conditions? What have been the pitfalls and opportunities? Societal, demographic and technology change is throwing up demand for totally new services. But how to best identify and meet those needs? who better to answer that than Catalina who runs Vitalia, a chain of 23 for-profit day centres in Spain, running patented programmes targeted at conditions such as stroke recovery, rheumatism, Parkinsons and even Alzheimers. Hoffmann is now expanding into Brazil and Mexico and has an eye on the USA. SARQuavitae is Spain's largest nursing home and elderly care group. Jose explores opportunities in outsourcing, the step down market and homecare. Former director of Romanian hospital group Regina Maria, Sergiu, an INSEAD MBA alumnus and Harvard-trained in private healthcare management, has over a decade's experience of private healthcare in East Europe, including general management, advisory, greenfield developments and M&A. Massive Turkish PPPs are changing the face of public healthcare in Turkey. The consortia behind their construction will also operate long-term imaging, lab, sterilization, physical therapy and IT services. How are these huge projects (the largest is a 3,600 bed hospital in Ankara) shaping up and what are the lessons for East Europe? Ismail also looks at radiotherapy and nuclear medicine opportunities across East Europe and Turkey. A conglomerate focused on healthcare, Bozlu is a medtech supplier, a radiopharmaceuticals manufacturer, a distributor, a service operator in imaging and radiotherapy and has recently bought medtech IP companies in Denmark and the USA. The Polish private sector continues to grow fast and has attracted a wide range of foreign investors and operators. LUX MED is the largest private operator. Anna looks at the opportunities that patient demand and political change will create over the next five years. NYSE-quoted Medical Properties Trust has pioneered sale and leaseback deals in Germany (RHM, Median). It has also just bought UK operator Circle Health’s Bath unit. Here, Frank looks at casestudies of how hospital and rehabilitation operators are using real estate sale and leasebacks to finance growth. How should operators approach real estate deals and what are challenges do they need to overcome? Property investors of all types are zeroing on healthcare services in Europe. Often they will work with private equity investors. Tom gives an overview of the main sectors and countries in the market and looks at the new types of investors who are emerging. What implications does this have for the sector? International healthcare company Bupa surveyed more than 8,500 consumers worldwide to understand what motivated them to purchase services ranging from dentistry, acute care and care homes through to insurance. Theresa looks at how Bupa is now using the findings to change staff behaviour, to deliver improved services and to enhance the Bupa brand. Medtech prices in Europe can vary significantly according to benchmark studies. Swegmark, with a background from Pan-European players Capio and Unilabs, looks at the findings of cross-border benchmarking exercises, at suppliers' reactions and how to cut prices by up to 20%. Purch works in healthcare procurement for both the public and private sector across Europe. Skill and staff shortages are the single biggest limitor for healthcare service operators worldwide. So how do you build and implement a recruitment and retention programme which is cost effective and delivers quality talent? Jill will examine innovative approaches and leading strategies to build your 21st century workforce. She has grown Cielo Healthcare into the world's largest healthcare recruitment process outsourcing provider, active in Europe, Middle East, as well as North America. She was formerly the Chief HR Executive for Wheaton Franciscan Healthcare, an integrated healthcare system in the Midwest USA with nearly 25,000 employees. A Swiss economist, Patrick has been developin a TCO model for 15 years in the lab sector. This, he claims, can boost EBITDA by 10-15 nominal percentage points. He says the model is generally applicable to capital equipment and even to whole facilities. Patrick gives a conceptual overview of the model and briefly looks at the Russian market, where Citilab is one of the main players. How to Lobby Effectively Ms Annette Kumlien, COO, former CFO Diaverum Tariffs, outsourcing, building a wider service offering - working closely with public payors and governments is crucial to Diaverum, which runs dialysis clinics in 18 countries and four continents. Annette looks at the lessons Diaverum has learnt about effective lobbying. Investing Internationally in Healthcare Services Khawar Mann, Managing Director, The Abraaj Group Abraaj is the most experienced investor in healthcare services in the developing world with deals covering Africa, India, the Middle East and East Asia. So what are the threats and what are the opportunities? And how do these regions stack up to Europe and the USA? Investing in healthcare services in Asia Eric Souetre, Executive Chairman, Careventures Founder, director and former CEO of Labco, Eric has spent the past five years exploring and investing in healthcare in China and South East Asia through his pledge fund, Careventures. He talks about the challenges and opportunities of investing in sectors which enjoy growth rates of up to 40% PA.